Nuff is the Network Universal Frame Forge. Nuff bundles together a scheme interpreter, low-level bindings to unix networking interfaces, and scheme functions and macros for dealing with network packets. For installation instructions and a quick start guide, see the README file. For in-depth discussion of nuff and its features, see Nuff - The Language. Nuff version 1.2.1 is available for download! Your rights to distribute and modify nuff are protected under the terms and conditions of the GNU General Public License. 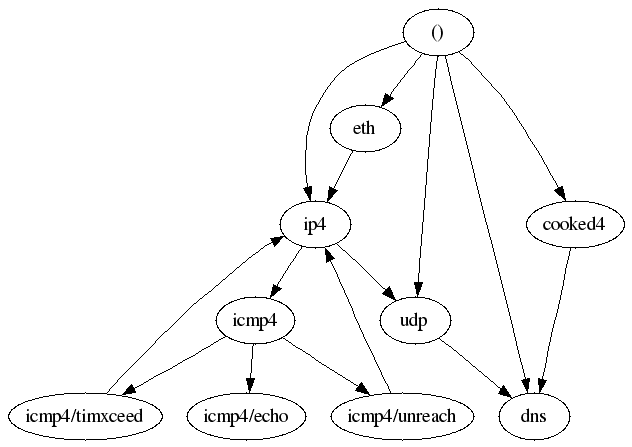 Here is an image of nuff's layers as a directed graph generated by graphviz. New nuff utility released: dnsd, a simple, secure, smart DNS server. Read the whitepaper! All material is © Doug Hoyte and/or HCSW Labs unless otherwise noted or implied.